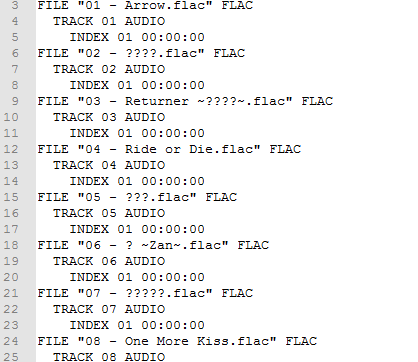 When the names of the audio files are in japanese, the CUE maker replaces the japanese characters with ????? How can I fix it? Or is it a bug? You need to save it in Unicode format. It should be an option in the 'Save' dialog box. Probably under the 'File Type' drop down box. Oh, thanks, it worked perfectly.